Description: This is a sparrow-sized, darkish brown and white plover. They have a single, dark neck band in all plumages. In breeding plumage, the short bill is black-tipped and orange-based and legs are yellow-orange. The forehead is white with black borders and a white dot is visible behind and above each eye. During the nonbreeding season, the black markings and their overall body color is lighter brown, the bill has little or no orange at the base and legs become lighter. A white supercilium extends beyond the eye. 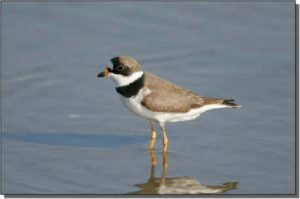 Similar Species: Within the Great Plains, the darker body color and complete neck band separate it from Snowy and Piping plovers. 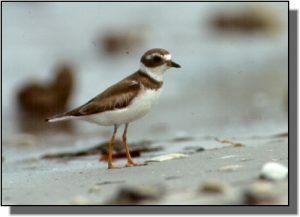 Smaller body and bill size separate it from Wilson’s Plover and the single neck band and smaller size distinguish it from Killdeer. Comments: An arctic breeder, this plover is usually seen during spring and fall migration within the Great Plains. They can be found on open mudflats and on sandy shorelines.